This colourful dish was inspired by a 'chicken fajita pasta' recipe I found over on the Good Housekeeping website. You may be wondering how I managed to end up turning a pasta bake recipe into a rice dish, and initially I did try a straightforward ingredient swap for the original recipe. With the leftover ingredients I decided to switch things up the following day using rice instead and found that I actually preferred the rice bowl version! The original recipe calls for chicken, which I replaced with Quorn pieces and combined with the red onions, peppers and fajita seasoning. Just like in the original recipe I added tomato paste, salsa and water, then simply stirred in a packet of microwave rice and topped the bowl with sliced avocado and fresh coriander for the perfect quick weeknight dinner. 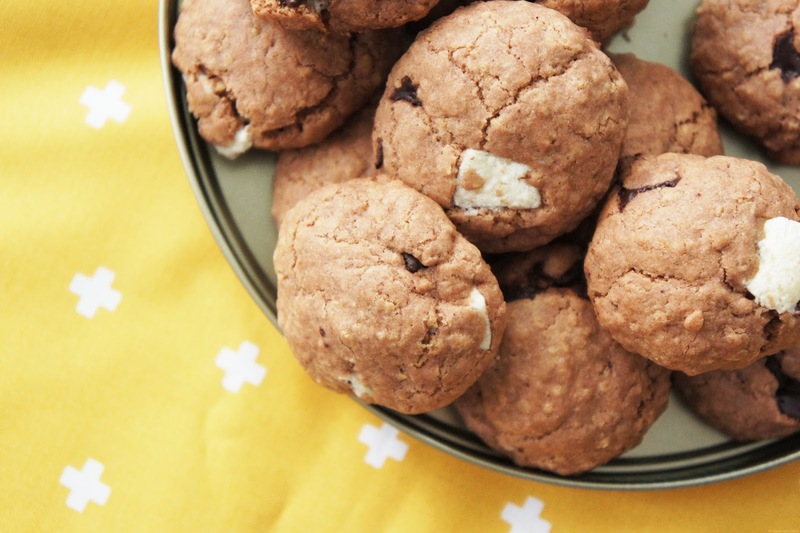 These cookie treats were adapted from the It Doesn't Taste Like Chicken recipe I mentioned in my recent post 3 Cookie Recipes I Love (Gluten Free/Vegan). Similarly to my first batch I used Doves Farm flour to make the cookies gluten free but also subbed a little of the flour for cocoa powder. I then added in a mix of dark and white dairy free chocolate chunks for an extra chocolate boost! Batch number three saw me adapt the same recipe to create chocolate orange cookies for a friend's birthday. Next up I'm planning to try white chocolate and raspberry! It's no secret that I'm a huge fan of pasta, I very much doubt I'll be able get through any posts in this series without including some sort of pasta dish! This time around I was looking for a new way to use up a small packet of exotic mushrooms and decided to add them to a simple white pasta sauce. To make my vegan/gluten free white sauce I like to use dairy free spread, a gluten free flour blend and coconut milk (Koko brand is my favourite). To give the sauce some flavour I usually use garlic oil, wholegrain mustard, nutritional yeast flakes, salt and black pepper. Along with the mushrooms I fried some onion and added these to the finished sauce before stirring through some gluten free tagliatelle and serving with some homemade garlic bread. If you missed my last Cooking Lately post you can catch it here!